As a consultancy, interested attorneys need to be on a consulting retainer with us. Service packages include weekly, twice-monthly or monthly calls. They also include different reporting and analysis tools. Thanks to our partnership with Conductor SearchLight, we can now offer a premium SEO suite for clients on our higher-tier plans. You select the resources for your project, and Wiideman Consulting Group hires and trains them, and they then work from our offices here in La Mirada, CA. We recommend a PPC Specialist (AdWords & Facebook), an SEO Content Writer, and a Web Visibility Specialist (link-earning, local SEO, and social media). You own all of your assets since we are just your wingman, so everything we work on is held in a Google Drive folder you’ll have access to, including your passwords credentials sheet. You will also have access to our proprietary SEO Roadmap, so you can observe and participate in the daily activities that go on between the various team members. Efficiency in project management is key. Our team will work closely with you within our SEO Roadmap to ensure tasks are getting done on time and by the right team members. A snippet from December deliverables in an active project can be seen below. A core competency of Wiideman Consulting Group is advanced search engine optimization. We’ve been training agencies and enterprise brands in the various disciplines of organic SEO for over a decade. With our team handling the technical, contextual and visibility tasks involved in our SEO strategy, keyword rankings will continue to move up; and the quantity of pages ranking for keywords will increase as well. Below is a snippet from a recent report that goes out automatically every week. The report shows significant ranking improvements near the beginning of the campaign. Growth slows as your pages get closer to the top, but they will grow nonetheless. Organic SEO involves a thorough strategy with emphasis on technical optimization, persuasive practice area content, and a creative content marketing strategy designed to attract links (with minimal outreach and influencer marketing). 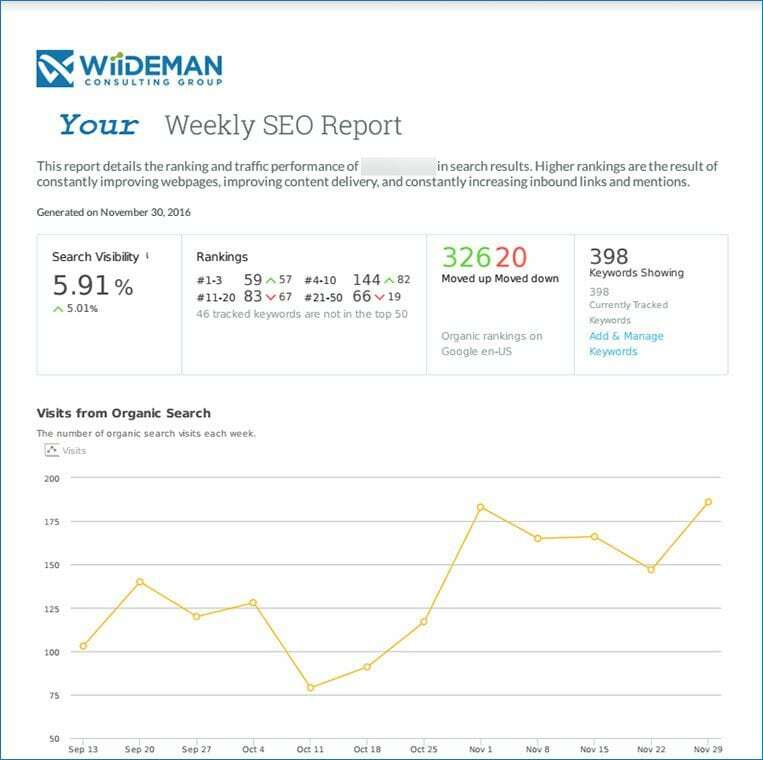 Learn more about how SEO for lawyers works and how Wiideman Consulting Group can help. AdWords ads now dominate the entire “above the fold” area in desktop and mobile search results. To not be bidding on relevant keywords excludes your law firm from a significant amount of Google search traffic. Bing also offers AdCenter, a smaller competitor to Google, but equally important. Our PPC Advertising Specialists hail from over 10 years of corporate experience with companies as large as Disney, Expedia, and other brands you would recognize. 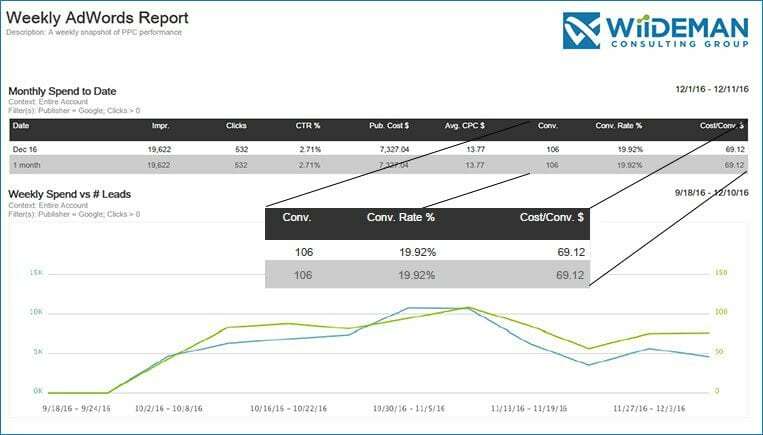 It can take several months to reach your return on ad spend (ROAS) and cost-per-acquisition (CPA) goals, so it’s important to be patient as our team learns what works best for your brand in terms of targeting mechanisms. Below is a sample report generated through our partners at Marin Software and delivered directly to your inbox each week. The report shows how we were able to get CPA down to $69 per lead with 106 leads. This particular client had been paying over $250 per lead! At the pace we’re at currently, we expect CPA to be at $25 by May of 2017 with continued nurturing at the campaign, ad group, keyword and ad levels within AdWords. Learn more about our PPC advertising services for attorneys to see if we’re the right fit for your law firm. Our Founder, Steve Wiideman, was a production manager for a popular local SEO platform for several years. 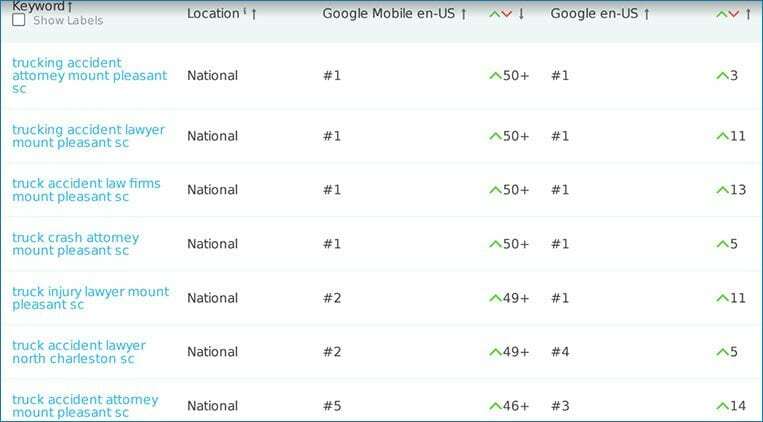 We know location-based SEO inside and out, having won multiple awards for multi-location and franchise search engine optimization. Steve also speaks at local SEO conferences and consults for various platforms you may have learned about while doing your research. Our team will help you setup an account with a trusted data partner, nurture your database accuracy to perfection, and monitor changes. Our technology team will work with your content writer to create the absolute most helpful and hyperlocal landing page for each location you have an office in. Finally, your dedicated Web Visibility Specialist will work with our strategists to syndicate your law firm office address, phone number and location URL to search engines, navigation engines, law directories, and regional directories, while also performing outreach related to the content marketing strategy for organic SEO. 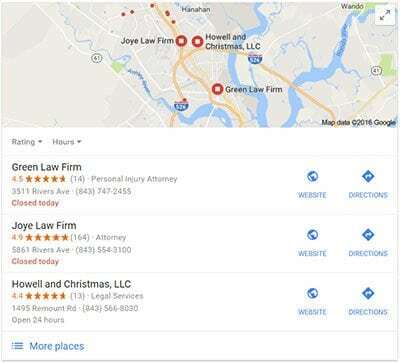 Let’s just say “we know our stuff” when it comes to local SEO for lawyers, and look forward to helping you improve rankings in Google’s 3-Pack. Depending on the scope of your engagement with us, we’ll be addressing all three. We’ll know exactly what potential clients in your area are saying about you and about your competition. We’ll reach out to potential content contributors (and sharers), and will promote your content through status posts (and boosted or promoted posts when applicable). You’ll grow followers in your state every week, and build an army of micro-influencers who will help you get that helpful content in front of as many people as possible. Call us today to learn more about our programs for lawyer social media marketing. Our Web Analytics Strategist is a genius with custom reporting and lead attribution modeling. The first month of service with us will be packed with rebuilding your Google Tag Manager and custom reports within Google Analytics, allowing us and you to see reporting your competitors haven’t even thought of yet, such as Click Trees which make it possible to view a typical user’s journey in reverse. These insights help our team understand what is helpful and what is not on your law firm’s website. Together and with your approval, we’ll emphasize elements that contribute to higher conversion rates and de-emphasize focal points that provide little value or distract your visitors. 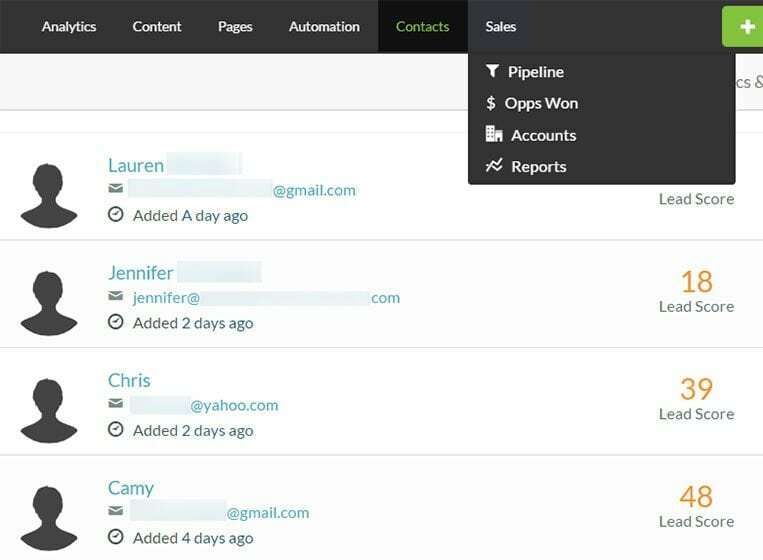 Thanks to our partners at SharpSpring, we now offer full CRM integration. This means your leads don’t just get emailed and die, or get added to some horrific Google Sheet. Instead, they go directly into a CRM so together we can track who became a customer and ultimately track your ROI once you know what a case settled for. We hope you obsess over analytics the way we do. We want to track absolutely everything, including phone calls, live chats, click-to-call phone actions, and form submissions. The more we track, the more we know how to improve the website to convert even more of your visitors into leads. 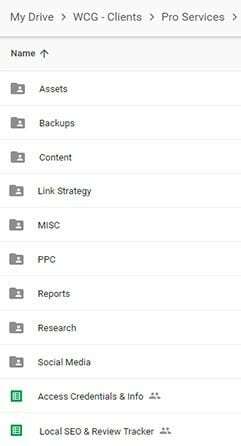 Below is a screenshot of what you can expect to see within your Google Analytics as we kick paid and organic search engine optimization up, allowing us to track the goals mentioned above. You must have a million questions, and we’re ready to help answer them. Call us today to talk about analytics and lead intake for attorneys at (562) 732-4417, or fill out the form below.